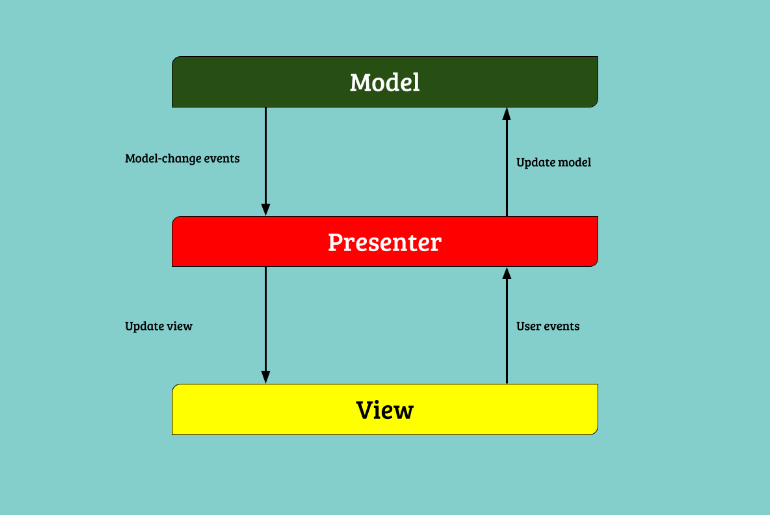 MVP (Model View Presenter) design pattern is derived from MVC pattern most of the things is same, where is the controller is replaced by presenter. The MVP design pattern is set of guidelines that should follow for better code reusability and testability. As per MVP guidelines application divided into three part Model, View Presenter. MVP pattern is address the common difficulties in android app, especially problem is related to maintainability and testability. Model View Presenter increases the view separation of the concern and facilitated unit testing . Using a consistent architectural and design pattern the development process become much more consistent, a lot of easier and transparent. This way the application become more simpler, overall application reliability increases remarkable. The application code become cleaner and readable. Code maintainability become better and most importantly becomes fun and developer are Happy 🙂 . The MVP pattern is user interface software architecture pattern that reduces the behaviour of UI component. In this case it reduces the interaction with Activity and Fragment bare minimum by using presenter. The Pressenter simply a controller like class to handle presentation logic and update view accordingly. Using presenter we can write business logic in presenter layer that have minimum interaction with views that make much easier to test and much faster to test. Why it make faster to test, Well simply put we no longer need to test input and output . the android content is gone so we no need of android emulator and device , We just need on JVM for running test which is quit fast . Just review the above figure that give explanation How MVP is work. Suppose the have show some user information with couple of variable like first and last name. The user make change in first and last name and save the information on by clicking on save button. In this state the presenter will be involved by obtaining first and last name, now presenter will check these are valid or not. If value invalid then presenter makes the error and show the error message on the view. However the case value are correct the update the model and send callback to view showing updated value on the views . The Robert C Martin say in A Handbook of Agile Software Craftsmanship – The one way to make deadline – the one way to go fast – Is the keep the code as clean as possible all times. In the clean architecture each layer have own models and models contains data relevant only to that layer. When data move between layer – the Model is transformed from one layer representation layer to another. A Presenter is a middle man between views and Model , It is also contain business logic to the presentation of data . The Presenter the retrive the data from model and format the data before passing the view . The Presenter also update the UI via View. The Views is expose methods which control presentattion of data or model for instance show or hide certain element. Few important things keep in mind while using any design pattern . Now we will a sample app following a MVP design pattern. Open Android Studio and create a new project. Enter project name like MVP example and select empty template and change activity name as LoginActivity . in LoginModel you seeing we are using a LoginRepository. So create a new interface which provide user instance and save the user instance in repository. As per MVP we have created Model, View on above, Now we will create a presenter for LoginActivity, Just create a java class with named is LoginActivityPresenter which implementing LoginActivityMVP.Presenter. In presenter we are doing the following operation. I have distributed project in different package. So all project structure is looks like below figure. create a new package inside base package name is root. Now create a new class name AppModule in root package. Finally, just rebuild the project, after rebuilding the DaggerAppComponent will be created. Then import the class and Run the project. This is the best way to using an MVP design pattern, activity will always clean and the code is maintainable and testable.